Monday March 13 2007, It was the happiest occasion for Mrs. Oksana as she witnessed the Britot Milah of all her four sons taking place in one day. 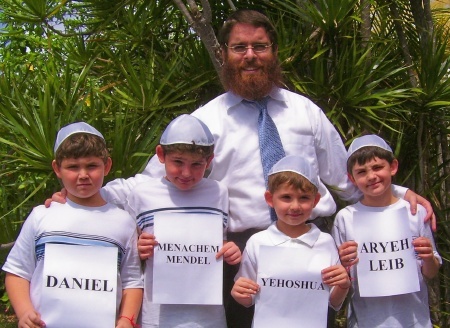 The four boys, aged six through ten, received the Jewish names Daniel, Menachem Mendel, Yehoshua and Aryeh Leib. The Britot were performed by Rabbi Yaron Amit, expert Mohel and International Director of Brit Yosef Yitzchak –an organization which has currently provided over 29,000 Britot Milah worldwide for boys and men of all ages. The elated mother told Rabbi Zalman Gansburg, Executive Director of Brit Yosef Yitzchak for the United States, “I want to say how grateful I am for helping my children finally have the gift of a Brit Milah! This is truly the greatest of Mitzvoth."